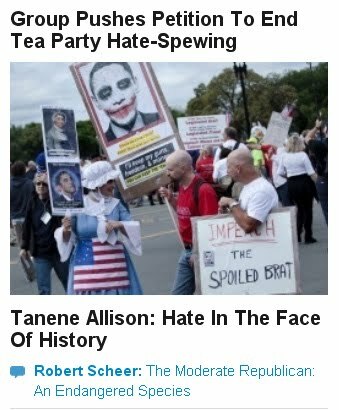 Summary: Like a child who offers an escalating series of lies to her parents of why their cookie jar lies broken on the kitchen floor, while her fingers are covered in cookie residue, HuffPost has clearly decided to triple-down on its incitement of hatred against the Tea Party, based on what we now know to be lies, smears and manipulation. Contrary to its claims that it is a "nonpartisan newspaper," that "there is no right-wing or left-wing news," and that it is merely "ferreting out the truth, consequences be damned" (see Section A here), HuffPost is willfully ignoring the truths that have been documented in recent days, about the lies behind the racist allegations it's made against the Tea Party. HuffPost apparently is intent now to push all its chips into the center of the poker table, in the hopes that no one has been documenting the truth, and has the spine to publicize it. News flash, HuffPost: You're wrong on both counts. During the health care debate on Saturday, Tea Party protesters hurled racist and homophobic epithets at House Democrats. Rep. Emanuel Cleaver (D-Mo.) was spat on by a protester, Rep. John Lewis (D-Ga.), a civil rights icon, was called a 'ni--er,' and openly gay Rep. Barney Frank (D-Mass.) was called a "fa---t" and heckled with deliberately lisp-y screams. On Wednesday, a Latino Facebook group called "Cuéntame" posted a video documenting the Tea Party hate-spewing, and asked viewers to sign an online petition to the leaders of the Republican party asking them to apologize for egging on abusive protesters. The video, produced by Brave New Foundation, shows Republican lawmakers waving signs from a balcony and applauding the crowd of Tea Party protesters as they shout racial and homophobic slurs. Let's debunk and clarify this stream of pablum, one deceptive item at a time. (1) "Tea Party protesters hurled racist and homophobic epithets at House Democrats." As documented here and in the update items, there is zero proof --- none --- that racial epithets were hurled at any black Congressman by any Tea Party protester(s). To the contrary, multiple videos taken of the scene at the location and time show it didn't happen, period. Not that anyone was expecting or hoping for anything untoward to happen, of course. Why, that'd be downright un-American. And after all this, not a single person has been able to come forward with a single second of video or audio recording to show that any Tea Party protester did what was alleged. (2) "Openly gay Rep. Barney Frank (D-Mass.) was called a "fa---t'"
And the proof of this is where, Ms. Bassett? The proof is where, HuffPost? Oh, right --- there is no proof at all. (3) "On Wednesday, a Latino Facebook group called "Cuéntame" posted a video documenting the Tea Party hate-spewing, and asked viewers to sign an online petition to the leaders of the Republican party asking them to apologize for egging on abusive protesters." The video you cite did not show "Tea Party hate-spewing." What it showed was certain attendees of a Tea Party event, held on public property --- over whom the organizers had zero control --- expressing opinions that many (including us at Huff-Watch) find objectionable. And who is "Cuéntame"? See (4), below, and recall candidate Obama's claim that William Ayers, with whom he worked for years, and in whose living room he started his political career, is "just a guy who lives in my neighborhood." (4) "The video, produced by Brave New Foundation, shows Republican lawmakers waving signs from a balcony and applauding the crowd of Tea Party protesters as they shout racial and homophobic slurs." First, who is "Brave New Foundation"? Hint: It's no stranger to HuffPost: as documented here, only four days earlier --- on March 20 --- HuffPost took what amounted to a press release from BNF that was filled with inflammatory smears against the Tea Party, and disguised it as a "news" story. Unsurprisingly, this "article" incited hateful, misconception-drenched user comments, which HuffPost went on to review, approve and decide to publish. Second, no "Republican lawmakers"... were "applauding... Tea Party protesters as they shout(ed) racial and homophobic slurs." It didn't happen --- period --- as the BNF video shows. If Ms. Bassett and HuffPost were even remotely interested in "ferreting out the truth, consequences be damned" (see Section A here), they never would have made such inflammatory claims (which, by the way, Ms. Huffington recently claimed are prohibited at HuffPost). OF COURSE these are the kind of demagogues who've been running our country for years. They invaded Iraq to fight a proxy war for their Likud handlers in Jerusalem. [...] From Bush, Likud's sock puppet, on down. yeah, no need to censor them. it would be better if people started kicking their teeth in. Believe me, we're ready. We're going to start taking an arm for an arm, tooth for tooth etc. Wait for us to start spitting on republiklans and throwing bricks into their offices, and threatening the lives of your representatives children (and we don't just "threaten"). We're ready 4 u! So Black conservatives like Thomas Sowell, Herman Cain, they're racists too? You libs keep this up, you sound more deranged and desperate every day. Thomas Sowell and Herman Cain aren't racists. Just Oreos. I don't like it and I will deffend the United States from UnAmerican/Anti- American teabaggers as much as needed. They are domestic terrorists and should be prosecuted for crimes against their own country. It's time to start calling the Teabaggers what they are - a hate group that is rapidly morphing into a domestic terrorist group. Their concerns are NOT legitimate. Their beliefs are based on lies, bigotry and terrifying pride in their ignorance. Their exercise of free speech is very American. The philosophy they espouse is totalitarianism led by white Christians. That is not American. Those loons don’t care who they hurt because their selfish and racist – If your white your alright, if your black stay back. Tea party mentality is a nutshell. Those people should be arrested. Calling someone a "n*****" , a "f*****"? Isn't that a hate crime? An assault? The Rethugs want these people to do their dirty work. They want someone killed. Period. Then they'll say they didn't want anyone hurt. These poor, ignorant people. They're being used and don't realize it. Alas, if only it were that simple. Because the bald fact is that people threatened Bush at protests all the time by displaying menacing signs and messages — exactly as the anti-Obama protester just did in Maryland. Yet for reasons that are not entirely clear, none of those Bush-threateners at protests was ever arrested, questioned, or investigated (at least as far as I could tell). Don’t believe me? Then keep reading. Because this essay exists for one reason only: To prove beyond any doubt that explicit and implicit threats to Bush’s life were commonly displayed at public protests throughout his term as president. Below this introduction you will find dozens of examples of such threats — unaltered photographs from a wide variety of sources, along with links verifying their authenticity. More to come, as HuffPost provides the raw material.